Delivering some much anticipated upgrades from the previous iteration, the Aer Flight Pack 2 is a durable, functional pack with lots of organization that’s great for short trips and urban adventures. The first version of the Aer Flight Pack was an interesting concept that worked pretty well in practice. 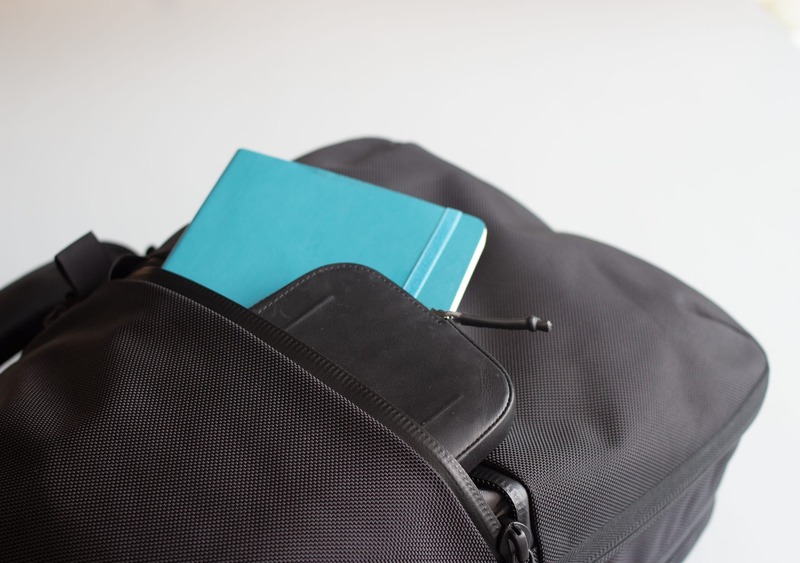 Not quite big enough to be a full backpack for longer travel, it made for a great weekend getaway pack and offered three modes of carry—briefcase, messenger, and backpack. We were impressed with that bag, but we did have a few nitpicks—mainly, that the transitions between the three carry modes were a little clunky. In rolls the Flight Pack 2, which promises to improve in those couple areas where the first bag left us wanting more. We’ve been hoping for smoother transitions between the carry modes, better performance in briefcase and messenger mode, and an upgraded harness system. To start off, the Flight Pack 2 is an attractive bag. We’re pretty confident that many would agree this thing looks great. The sleek, minimal, and refined appearance works perfectly in an urban environment, making it a great choice for business travel or just buzzing around a new city. Compared to its predecessor, the Flight Pack 2 has tightened up its style. Gone are the floppy edges, and instead we’re left with a more boxy and tight aesthetic. In fact, when placed side to side, this newer version makes the Flight Pack 1—which, at the time we thought looked really slick—appear a bit sloppy! One minor downside with the new design is that the capacity is a little smaller. The Flight Pack 2 carries only 21L, compared to the 23.6L capacity in the older model. However, the space inside is well-optimized, and the organizational features make up for the lack of space. But more on that later. 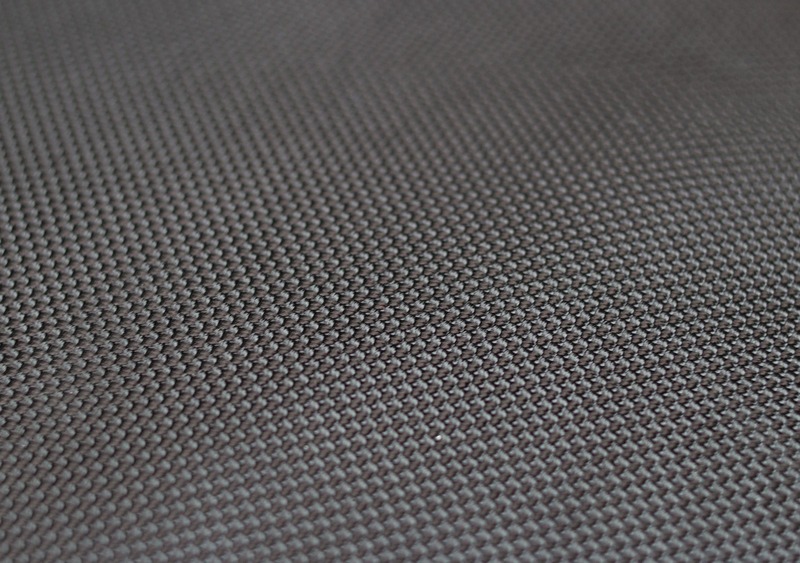 As with all Aer products, the materials on this bag are high quality and incredibly durable. The main fabric is an insanely robust 1680D CORDURA® ballistic nylon, which feels incredibly sturdy to the touch, and will be difficult to damage, no matter where you take this pack. Whatever you put in here will be well protected, that’s for sure. 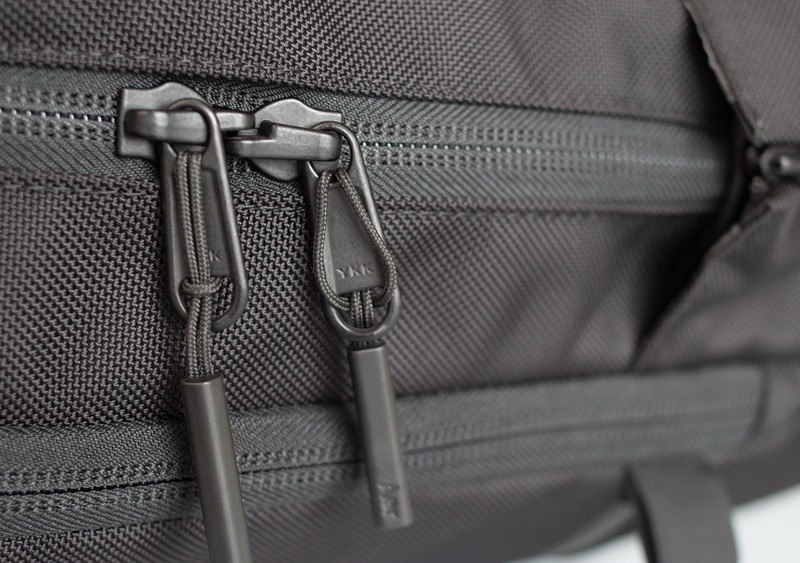 All of the compartments open and close with super tough YKK zippers, and there’s also strong Duraflex® clips on the straps, which we always love to see. 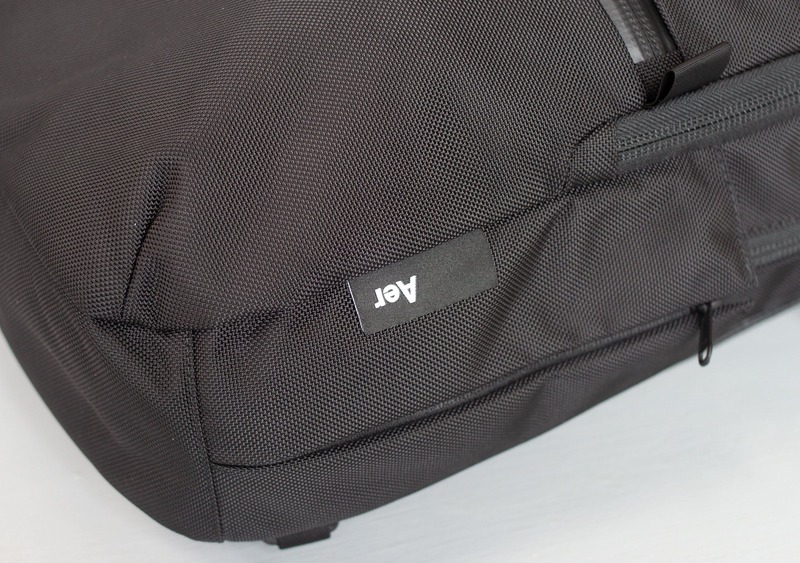 Usually, such sturdy materials come with a high price tag, so it’s nice to see that Aer is offering such sturdy materials at a lower price tag than many similar bags we’ve tested. Finally, there’s a small label in the corner of the bag showing the Aer logo. It’s tastefully done and not too obvious—we think it looks great! Always happy to rep a great company like Aer. As far as the external components go, we’re pleased to say that Aer has improved quite a bit here since the previous iteration. The most obvious area is the carry options—namely the backpack, messenger, and briefcases modes—and the transitions between them. We weren’t super pleased with this last time, so we’re pleased to see they’ve invested some time into creating a more streamlined solution. Let’s take a look! Right at the top of the pack there’s a nicely padded grab handle, which is basically unchanged from the original pack. 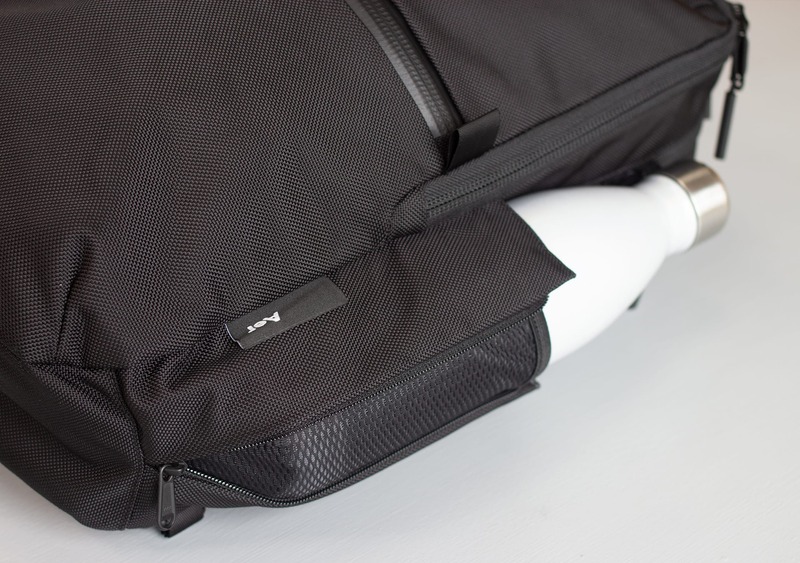 It’s well-placed, and has just enough padding to make for a comfortable carry without feeling too big to grab. Some packs tend to go a little overboard here, but Aer got it just right. 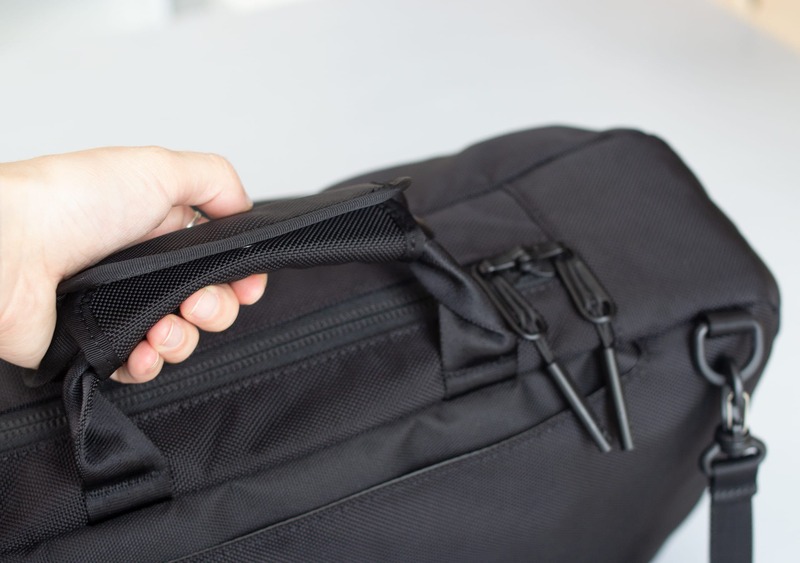 This isn’t really a carry option, but it is a useful place to grab the bag when taking it onto a bus or pulling it out of an overhead bin. Moving on to the first of the three main “carry modes”, we’re super happy to see the side handle that is used during briefcase mode has been improved since the last version. The Flight Pack 1 had a couple points of attachment here that were secured at a strange angle, meaning carrying in briefcase mode didn’t feel comfortable at all… The bag would hang kind of lopsided, which is less than ideal. We’re not totally sure if this briefcase mode was a big focus of the Flight Pack 1, but in the Flight Pack 2 they have definitely fixed it up really well. Now, carrying with the side handle works very well. Rather than a single strip of fabric, it’s now a double handle that is clipped together with a wrap of fabric and secured with snap clips. Using two handles means it’s now properly anchored at four points, which distributes the weight perfectly and makes for a balanced, comfortable carry. One point to note here is that when the handles are snapped together, access to the main zippered compartment is restricted. You’ll need to put the bag down or hold the bag with only one part of the side handle if you want to fully access the main compartment. This is kind of a drag, but we don’t see how it could have been done differently. The front compartment is not hindered by the side handle, though, so you can open that right up even when in briefcase mode. Moving on to the second carry mode—messenger bag mode—there are clips on the corner of the bag that allow for a detachable messenger-style strap to be clipped on with those strong Duraflex buckles. A quick note about these clips: There are two D-ring clips at the bottom of the pack, which are used for the shoulder straps in backpack mode. 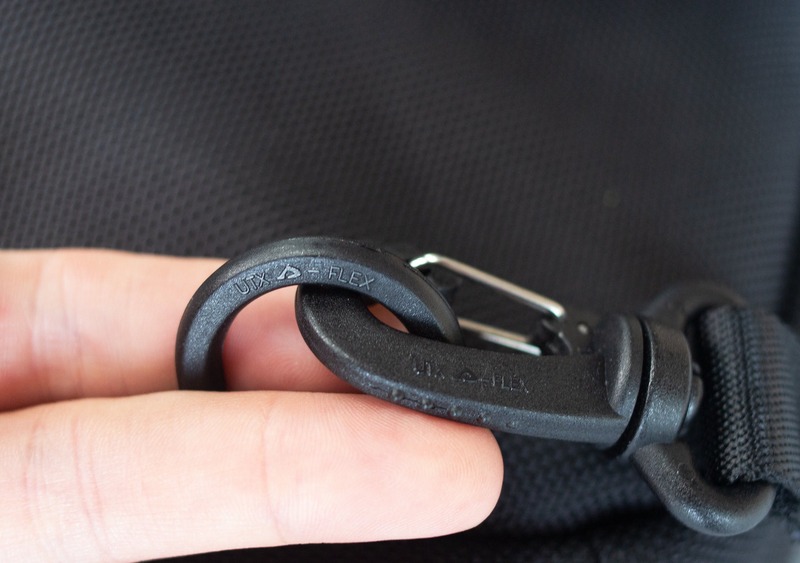 However, the messenger strap can be attached by two D-rings found on the left side of the pack. Details like the obvious placement of the strap attachments make this bag really intuitive to use. There is really no question which side the messenger strap attaches to, and we really like that Aer has put the time in to get this stuff right on this bag. We notice this stuff, Aer! Speaking of getting stuff right, we have to say that this is one of the most convincing messenger bag backpack setups we’ve tested. Some packs that go for the messenger bag style don’t really get the balance right, or the bag is just too bulky to feel comfortable being carried that way—but the slim profile of this pack makes for a pretty damn good carry. The bag sits nicely behind your back and without getting too vain about it… we think this thing looks pretty damn good in messenger mode! What do you think? Now let’s check out the third and final carry mode—backpack mode. This is our favorite carry mode by far (shocker, right?). 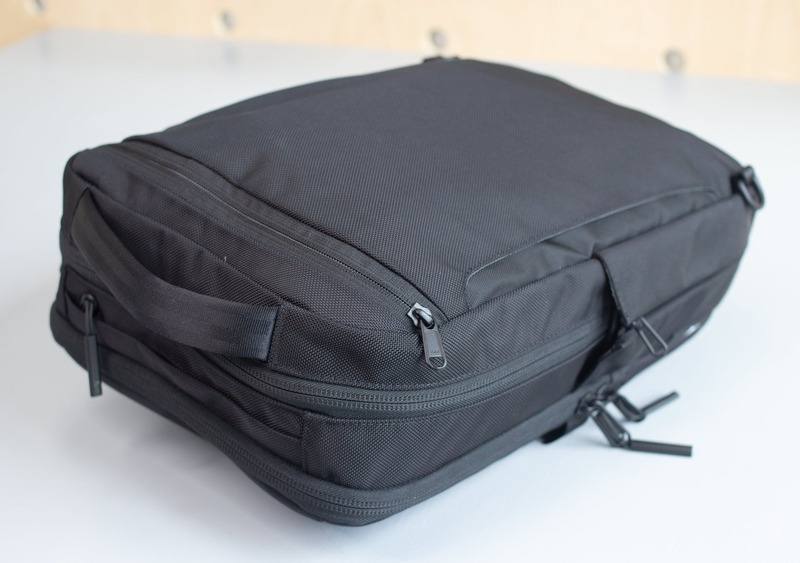 We think it is the best looking and most comfortable option, and carrying the bag upright also makes the internal organization work best, which we’ll get into later in the review. If the bag is in briefcase mode, you’ll notice a subtle compartment at the top of the bag—the shoulder straps are tucked away in there. Just pull them out and just pull them out and clip the Duraflex buckles to those D-rings at the bottom of the pack. And voila! You have yourself a backpack! The shoulder straps are well padded and contoured to fit your body, which we’ve been enjoying. There’s a nice upgrade here from the earlier version of this pack, with a bit of extra padding and a more ergonomic shape. And at the base of the straps there are some nice elastic keepers to keep the excess strap from flapping around in the wind. Another pack that’s committed itself to providing you with a #danglefreeexperience! One nitpick we have here is that when in use, the open compartment is… to put it bluntly, pretty ugly. Having an open zipper on the pack when the straps are in use just doesn’t look great. But the good news, of course, is that it’s against your back when the bag is in use, and to be honest we’re not sure how they could even pull this feature off without having that open zipper when the straps are in use. They could have opted for having no zipper at all on the compartment, as they did with the Flight Pack 1, but actually being able to zip the straps up when not in use keeps everything organized and clean. At the end of the day, we’d choose this version over the last version—it’s just worth noting that it’s a slight blemish on an otherwise incredibly good-looking pack. Next up, on the back of the pack there’s a good sized pass-through sleeve to attach the bag to the handle of your roller luggage—if that’s your thing. 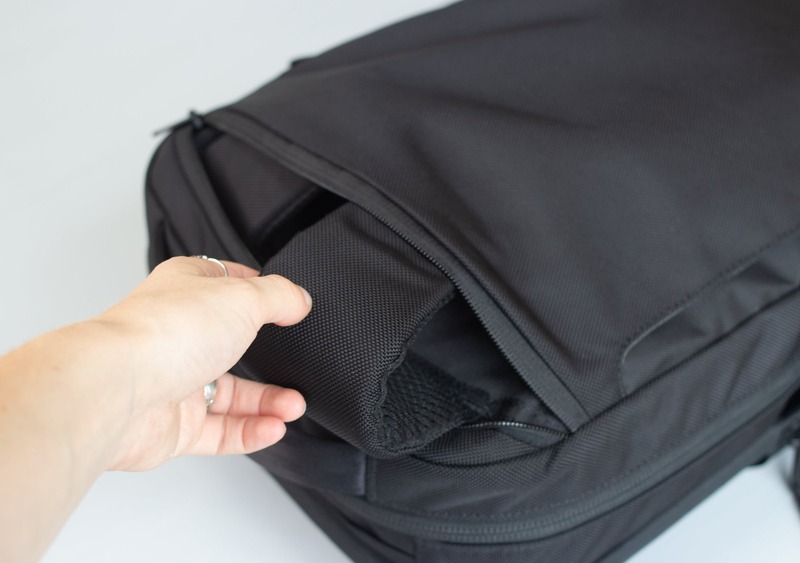 A lot of packs try to make these as tight as possible, but we often find they can be a little too tight to comfortably pass over the suitcase handle without getting caught. This is understandable, due to the fact there’s no standardized size for suitcase handles. But on the Flight Pack 2, Aer decided to make the pass-through section nice and wide. The potential downside of a wide pass-through is that it may slide around on top of your luggage and even pull it over. Luckily, at only 21L capacity, the Flight Pack 2 just doesn’t have the weight to pull your luggage over, meaning you really shouldn’t have any problems with this pass-through. It’s easy to slide on and off, and shouldn’t have any adverse effects on your luggage. Now, we have to quickly bring up one change from the Flight Pack 1 to 2 that we think is slightly negative. The back panel on this pack is still padded, but there’s no mesh. The previous iteration featured a mesh back panel that did allow some relief from sweaty-back syndrome, which we liked. We haven’t taken this pack out hiking or anything particularly adventurous, so we haven’t noticed any issues while just moving around the city. It’s not a deal-breaker, but it’s worth noting. We’re not entirely sure why Aer decided to remove this— it seems like an easy addition and we can’t see any benefit from taking it away. Unless it’s purely for aesthetic reasons? If anyone from Aer is reading this, we’d love to hear why this decision was made! Wrapping up the external components, there is that signature stealth water bottle pocket that we’ve seen on other Aer products including the Travel Pack(s). We absolutely love this innovative design that works so well in practice, and it gives the bag that classic Aer feel. The pocket zips up when not in use, laying totally flat. When you want to use it, just unzip it and pull out the elasticated section and you’re good to go. This pocket is flexible and ideal for storing water bottles, umbrellas, or any other tube-shaped items you might want to bring along. Great feature. Moving to the inside, we quickly noticed that Aer has re-designed the internal features from the ground up when designing the Flight Pack 2. There’s a lot of new features in here, so let’s dive right in to the easy access pocket on the top of the bag. 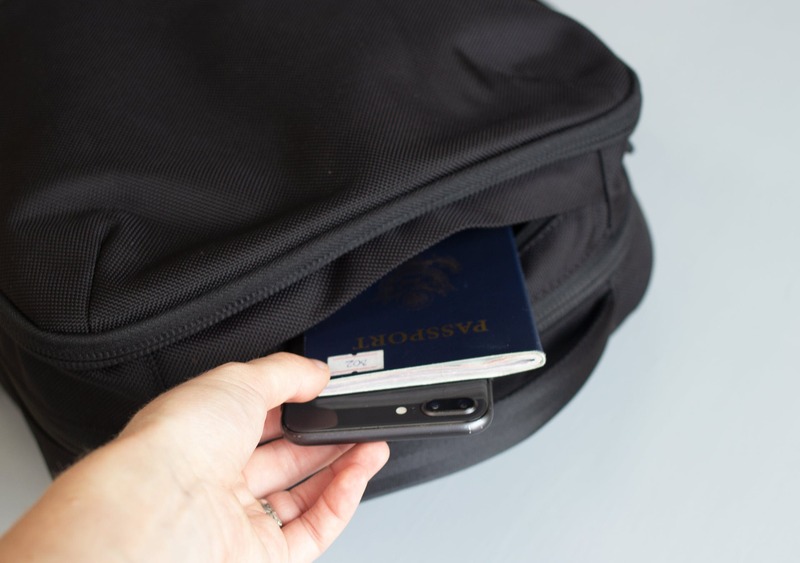 It’s really easy to just stuff things in here when moving through airport security, and like most quick-grab pockets, this is ideal for your passport, phone, or any other small items you want quick access to throughout the day. 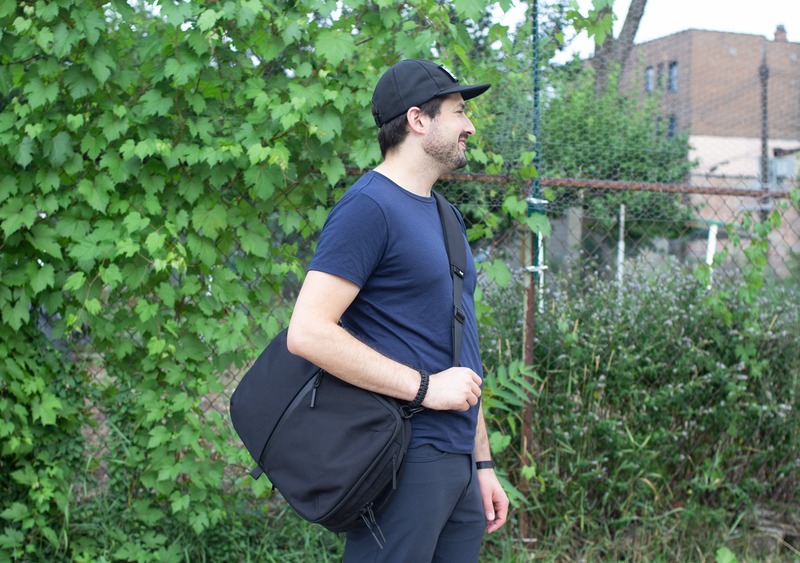 This quick-grab pocket is in a much better position than the previous version of the pack, so hats off to Aer for paying attention to customer demand and rethinking this one. Taking a look at the front of the pack, there’s only one pocket here—a full width, half height pocket that opens up with a strong AquaGuard YKK #10 Racquet Coil Zipper. Starting about half way up the pack, it goes right down to the bottom of the bag and has convenient zipper pulls to grab while opening it up. There’s not a lot of 3D space in here, so you’re best off storing flat items like notebooks, etc. You could store more bulky items if you want to, but just know that they are going to eat into the space available in the main compartment. The zippers here are water resistant and there’s also a convenient “zipper garage” at the end of the zipper, to add a little bit of water proofing where the actual zipper itself sits when this pocket is closed, which we think is a nice touch. Heading towards the larger pockets, there’s a horseshoe pocket that actually sits on top of the main compartment. This is the pocket that opens up fully even when the side handle is clipped together in briefcase mode. This compartment goes right from the top of the pack to the bottom and there are a lot of really nice organizational features in here. At the bottom, there are two elasticated half-pockets with nylon lining. They’re nice and stretchy to keep your gear in place, and we found them useful for small items that would otherwise be floating around your pack. Up one level, there is another row of pockets with elasticated tops. There are two larger pockets on either side, with a couple of sleeves for pens, pencils, etc. On top of this section there’s also a nice little mesh pocket, again with an elasticated opening. Finally, at the top of this horseshoe section there’s a YKK zippered-pocket that is about the right size to fit a Kindle or notepad. 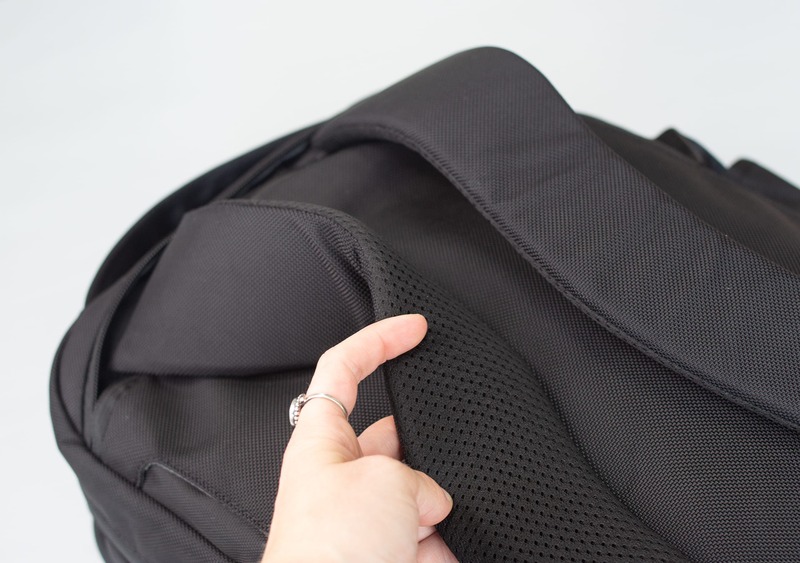 This pocket runs the full width of the pack, and it’s nice to know that because of the zipper, anything you put in here will be totally secure during your journey. Moving on to the main compartment, the first thing that stands out is that the zipper opens asymmetrically on either side. 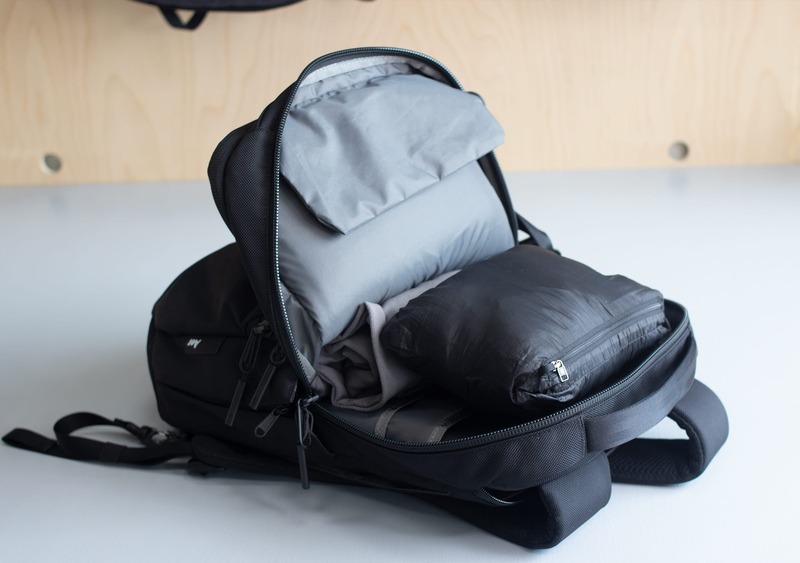 And as a reminder, if you do want to use these organizational features we would strongly recommend using the bag in backpack mode—that is, unless you enjoy all of your nicely organized items flying around the inside of your pack. Moving on, the main compartment organizer houses the laptop compartment. This area now has some padding, which can give your electronics some added protection—a nice upgrade from the Flight Pack 1, which had a total lack of padding. 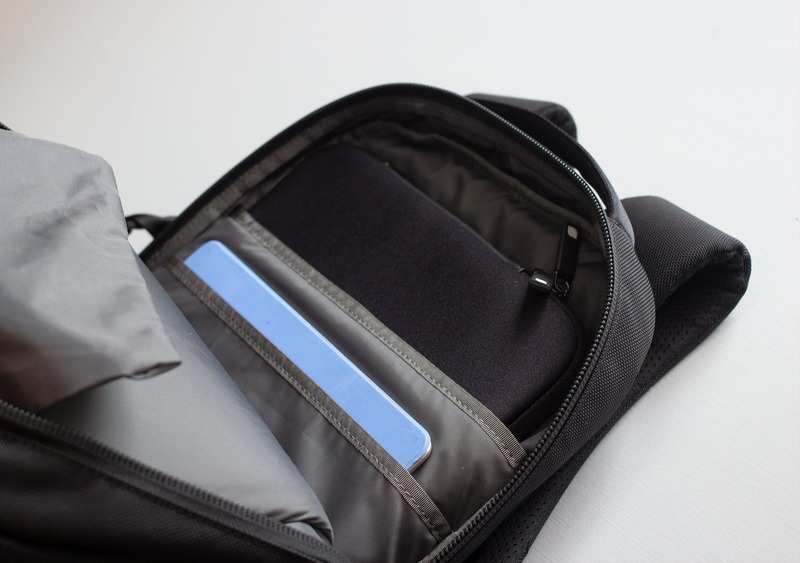 On the front of the laptop pocket is a smaller pocket that’s ideal for tablets or other flat items, and is about 8 inches deep. Despite the extra padding on these pockets—which we love, just to be clear—we still always recommend using a padded laptop sleeve for your laptop and tablets. You can never be too careful with those valuables, especially if—like most of us—you rely on them for work. On the other side of the main compartment there are even more organizational features. We’re almost starting to feel like this is a little overkill. There are two Velcro pockets here that go right down to the bottom of the pack, which are ideal for socks and underwear, or other little “bundles” that you want to stash away and not have bouncing around with your main gear. Aer has really gone all in on making a super organized travel experience here, with a lot of options. The good news is that if you don’t want to use them all, they pack flat when not in use. 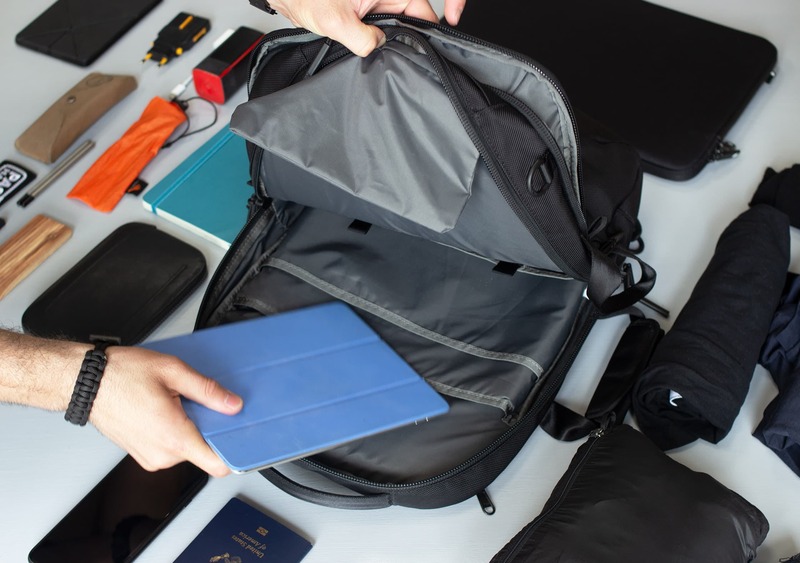 Now, speaking of organization… Anyone who is familiar with our reviews knows how much we love to preach about the use of packing cubes to keep your backpack organized. However in this case—get ready for it—we actually don’t recommend using packing cubes! The truth is, we were better off using the organizational features provided by Aer instead of trying to bring in extra organization of our own. In testing, we used a small Eagle Creek Pack-It Specter Cube and found it to be too wide, getting in the way of the bag’s built-in functionality more than it helped out. So, at long last, that wraps up the internal components of the pack. Overall, it’s a very well-organized experience, but we think it only really works if you play along with the system that Aer has created. 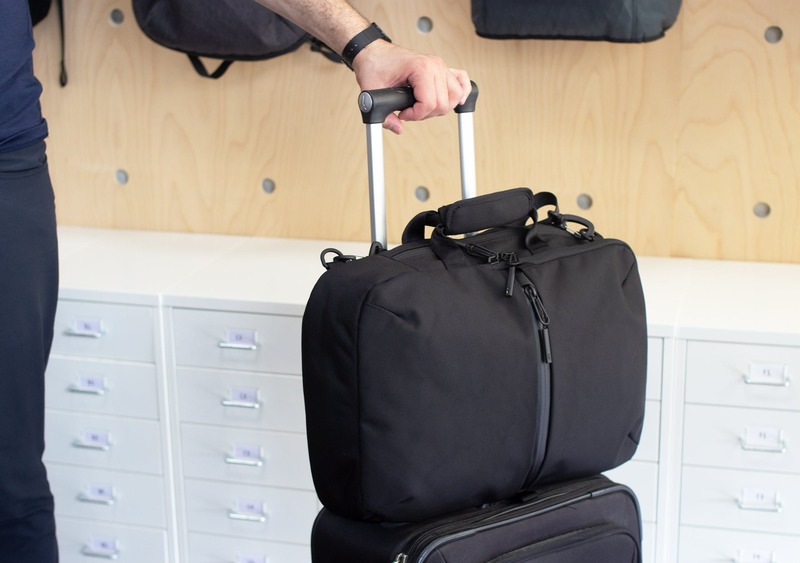 You heard it here first people—no need for packing cubes on this one! 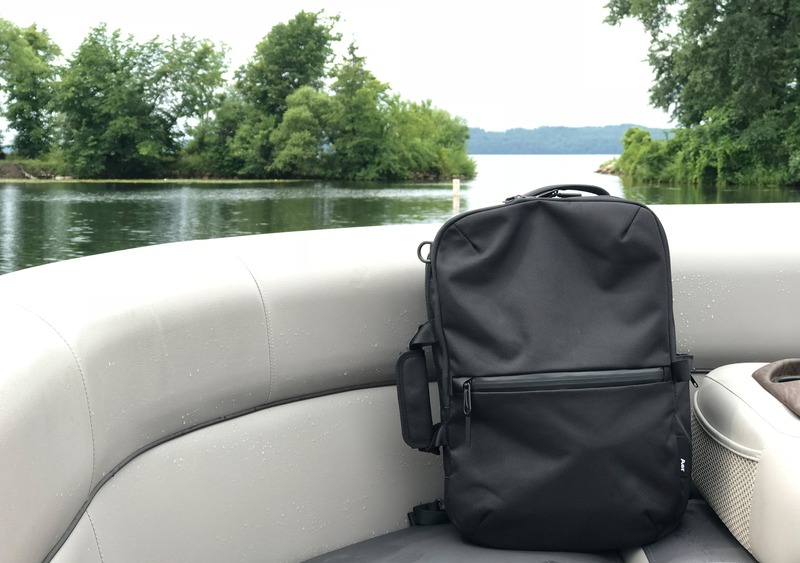 At the time of this review, we’ve been testing the Aer Flight Pack 2 for about 2 weeks both at home, in Detroit, and on a week long trip to Minnesota. As with all Aer bags, we have yet to disappointed. We’ve found the quick grab pocket to be really useful, especially at the airport when you’re able to dump all the contents of your pockets into one convenient place—rather than spilling it all out into those annoying bins. And durability-wise, we’ve had absolutely no issues at all. The materials on this bag—including the tough fabric, YKK zippers and Duraflex clips—are all super reliable, so although we’ve only been using it for two weeks, we can’t imagine having any problems in the foreseeable future. Durable materials keep it in perfect condition. Clean, slick looking pack made with durable materials. 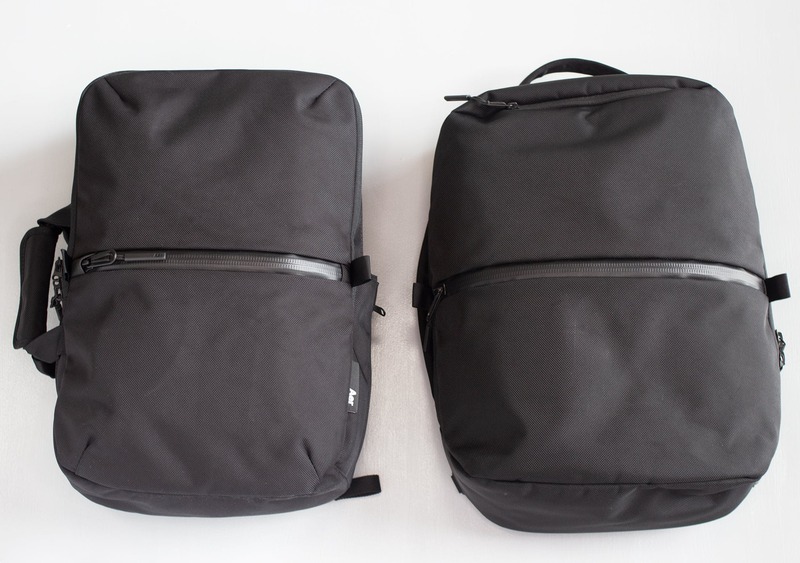 Streamlined transitions between backpack, messenger and briefcase modes. Well-thought-out organizational sections and features. Briefcase handles block access to the main compartment. Some aspects of the pack don’t work well in messenger or briefcase mode, meaning it works best as a backpack. Slight organization overkill, but it’s all optional and lays flat when not in use. The Aer Flight Pack 2 is a great travel companion for short journeys and fits in well in an urban environment. The transitions between the three carry modes have been improved since the previous version, and briefcase mode is definitely a more comfortable carry this time around. 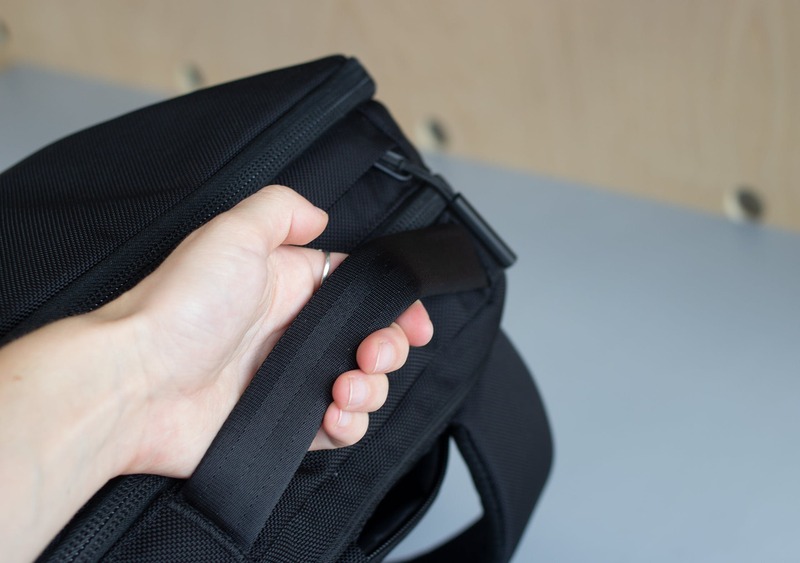 We think backpack mode is the best way to go—especially if you plan on making full use of the organization system—but the other two modes are there for you to use too. 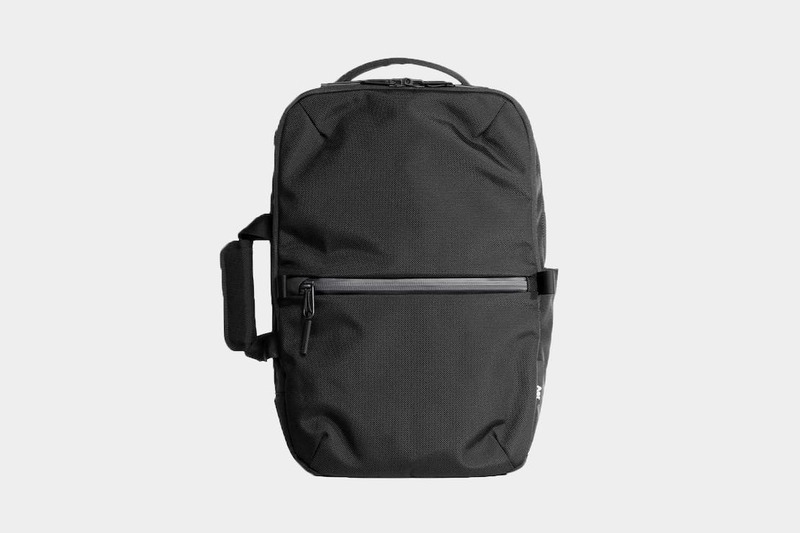 As always, this pack comes with the quality we expect from Aer—from the materials to the design, this is a solid, well-thought out pack for short trips and urban adventures.